I read a lot of history and was particularly interested in the Whiskey Rebellion in the 1790's because my wife and I had ancestors in the area at that time. As a matter of fact, my wife's ancestor, Johann Adam Wise was a distiller who produced Old Monongahela whiskey in Washington County, Pennsylvania in the late 18th century, so he was undoubtedly involved in the rebellion. History is always more interesting if it is relevant to you.That may be the only reason I finished this book. It is very scholarly done and obviously meticulously researched which is a polite way of saying that it is dry. Good history should also be engaging prose which this is not. It is by no means poorly written, but it does not address the topic from a position of entertainment. It's more like a textbook.I was further disappointed to find how little attention was paid to the heavy handed response that George Washington paid to the recalcitrant distillers when he led an army of nearly thirteen-thousand troop against them. It was a bigger army than he had during the Revolution.The one point of history with which I was in sympathetic agreement confirmed my contention that the saddest thing about the founding of the United States is that Aaron Burr didn't shoot Alexander Hamilton thirty years earlier. The author's work reveals the dramatic impact the national government of the 1790s had on frontier populations, and the injustice imposed on them through a tenacious effort to enforce excise taxes on those who stood the most to lose in terms of livelihood and liberty. The test of wills between the Washington administration and settlers beyond the Allegheny Highlands represented a sharp departure from the former's passion to defend the Republican principle of self-determination, but established a precedent in an enduring fiscal policy favoring an aristocratic elite. After reading this book, I realized that this epilogue to the American Revolution is much more significant than its mention in high school history classes. Good analysis of the Whiskey Rebellion and the ironic parallels between the American Revolution and the Rebellion. It was interesting to see how our founding fathers switched positions regarding excise taxes after they came into power. There were a lot of good facts and stories about live on the frontier. There are a lot of lessons to be learned 200 years later as urban oriented law makers lose touch with conditions in rural areas. The only down side of the book is that I felt like I was reading the same thing over and over, just with a slightly different slant. Just awful. I said at one point that I felt like I was reading someone's PhD dissertation. You know what? . . . . I was right. I should be careful though, I would not want anyone to read mine and write a comment. I did really the short vignettes at the beginning of each chapter, they were more the sort of history that I enjoy reading. An informative discussion of the contrasting perceptions and ideologies between the eastern and frontier societies. A little repetitive and though it attempts to bring its information together, it at times fails and leaves some loose ends. Popular understanding of the American Revolution and the Constitutional debate that followed it often neglects or deemphasizes the degree of opposition and antifederalist sentiment that existed at the time, particularly in the frontier regions. Thomas P. Slaughter attempts to bring these divisions to light in his study, The Whiskey Rebellion. Slaughter blends a Turnerian and Marxist approach by emphasizing the unique conditions on the frontier that prompted antifederalist sentiment and how these conditions overlapped with economic class distinctions. His analysis thus divides Americans into two camps: the Eastern, aristocratic “friends of order” and the Western, rural “friends of liberty,” explaining the conflict of the Whiskey Rebellion and other similar contests as the natural friction between these groups.Slaughter paints the American frontier in the 1790s as a brutal wasteland, defined by violence and populated by the destitute. Conflicts with Indians threatened settlers physically, while tax policy and Eastern land-grabbling speculators threatened them economically. The fact that a barter economy had arisen in the frontier speaks volumes to the situation. Many of these settlers identified with what they viewed as the spirit of the American Revolution, defined by a desire for local government and opposition to centralization. Sometimes characterized as “antifederalist,” Slaughter refers to those espousing this view as the “friends of liberty,” as they valued personal freedom seemingly above other concerns. Thus they were ideologically as well as pragmatically opposed to internal excise taxes, which seemed to place an undue burden on the poor while favoring the rich.Those labelled as rich were typically located in the East and certainly did not view themselves as opponents of liberty. However, they can be viewed as more conservative, striving to maintain order and the rule of law as the new nation, still in its vulnerable infancy, was beset by a multitude of issues. While these “friends of order” were certainly concerned with the social and economic well-being of the new nation and the maintenance of law and order, they were not unmotivated by their own personal economic gain as well. There were also external concerns, such as fears of plots by Britain and Spain and fears of the spreading anarchistic tendencies loosed by the French Revolution.The nation was thus split along class lines that coincided with a geographical East-West split. The West in this case was influenced by the unique conditions on the frontier. Each side of this conflict saw themselves as holding true to the goals of the American Revolution. Each had both ideological and practical reasons for holding to their convictions. As Slaughter states, “Neither perspective was 'right,' and neither was 'wrong.' Each made sense given the experiences, interests and ideology of its adherents. Problems came not from the incorrectness, insincerity, or immorality of one side or the other, but from the devotion of both sides to principles and self-interests that by 1786 led many to anticipate 'the horrors of a civil war. '”To his credit, Slaughter does not place the actors of the rebellion exclusively in the extremes of each camp, but successfully demonstrates these opposing views as existing on a spectrum, with many moderates on both sides. Interestingly, Slaughter depicts the leadership of the friends of liberty as being selected against their will from the wealthiest men that could be found to support the frontier dwellers. These men did not fully identify with the cause of the impoverished and their attempts at leadership were conducted only under threat of force.Despite the efforts of both sides, and despite the resolution to the affair, the rebellion failed to resolve any tension between the groups, instead making the situation worse moving forward. As Slaughter explains, “The Rebellion and the government's response thus exacerbated rather than cured the political conflict that rent America in the 1790s. It contributed as much as any single event to widening the breach between self-styled friends of liberty and friends of order.”For Slaughter, The Whiskey Rebellion was not about whiskey, it was about differences between rich and poor, between “civilization” and frontier, between order and liberty. Neither was it an isolated conflict. It embodied natural frictions between these groups that existed before the Constitution was drafted, and would continue to exist as the nation grew older, and indeed similar conflicts can be seen reflected in many of the political debates in the present day. The Whiskey Rebellion was the first serious challenge to the powers of the U.S. government under the new Constitution. It also saw the first and, so far, only time a U.S. President was in the field with a U.S. armed force in his capacity as Commander-in-Chief. Thomas Slaughter’s history of this conflict covers it well.He starts out with a thematic overview setting the context. Although I was already aware of the basic issue over whether the new federal government ought to be able to levy internal taxes (that is, levies not taken at customs), the analysis of the ideological dispute over them, which included the excise tax on spirits that was at the heart of the controversy, elucidated it quite well and with a level of detail I wasn’t heretofore familiar with. There was sectional strife between East and West, with the federal government giving frontier interests short shrift by not making the opening of the Mississippi River, the economic lifeline for frontier exports, a diplomatic priority. The early failures of the federal army in the ongoing war against the Indians of the Old Northwest were also a factor as the low-level war between the Indians and settlers was ruthlessly pursued by both sides. The frontier’s extreme poverty exacerbated the situation as whiskey became a more portable version of grain and a form of barter in a cash-poor economy. The excise tax hit their main trade good and demanded payment in cash. Particularly illuminating was the portrayal of George Washington’s greed for land, which included a willingness to bend the rules and gave him a disdain for the frontier settlers who were sometimes an impediment to his real estate acquisitions. One important point which Slaughter covers is that, even prior to the creation of the excise tax; western settlers were flirting with the idea of seceding and placing themselves under Spanish and/or British protection.One factor that wasn’t present was how the conflict was also caused by the different British cultures the groups came from. Slaughter’s book came three years before David Hackett Fisher’s Albion’s Seed and it would’ve been interesting to see how he would’ve incorporated the fact that the frontier settlers came from the Scots-Irish borderers while the groups running the central government came from other cultural backgrounds.The actual account of the conflict is quite good as well. Resistance started non-violently, with several local assemblies petitioning for redress. The elitist nature of the Federalists who ran the government, particularly Alexander Hamilton, in considering such extra-electoral responses inappropriate was well discussed. Slaughter generally does a good job in outlining Hamilton’s defense of the tax, including some tweaks he put through in response to some of the complaints and his advocacy of a military response. One note not covered was Hamilton’s ambition for military glory and what affect that may have had in shaping Hamilton’s approach. Four years later, at the outbreak of the Quasi-War with France, Hamilton successfully pushed for an appointment as a Major-General, which would’ve made him the senior army commander after Washington himself.Overall, this is a fine study of the subject. I’d like to compare it with William Hogeland’s later work at some point. In October of 1794, President Washington sent an army nearly 13,000 strong across the Allegheny Mountains into the frontier regions of Western Pennsylvania to suppress a popular uprising against the federal government. This event marked the greatest internal crisis of Washington's administration, and the most significant crisis of disunion to the United States prior to the Civil War. This significance of this event, both at the time, and to the continuing debate about the meaning of America, has often been overlooked or forgotten in popular histories. Thomas Slaughter's book goes a long way toward correcting that oversight.The Whiskey Rebellion was a reaction against an excise tax place on spirits, and shared much in common with the similar tax revolt against the Stamp Act that ignited the flames of the American Revolution. Indeed, the Whiskey rebels saw themselves as upholding the spirit of the Revolution, and believed that the leaders of the federal government had abandoned those principles in favor of personal gain.Slaughter does an outstanding job of telling each side of the story without a strong bias toward either side. He paints the rebellion as a massive failure to communicate between the parties involved. The conflict illustrated a deep divide between the East and the West of the country, setting urban against rural interests, localist ideologies against nationalist, and of course, all the familiar divisions that are inherent in class and economic differences. Slaughter describes the federal government and its supporters as having "generally shared a Hobbesian-type fear of anarchy as the starting point for their consideration," while he says that the Whiskey Rebels and their friends "took a more Lockeian-type stance," believing "that protection of liberty, not the maintenance of order, was the principal task of government." The federal government emphasized the power of the Constitution, while the Whiskey Rebels emphasized the much more radical Declaration of Independence.The Whiskey Rebellion was a turning point in America's history. It showed the central government's willingness and ability to enforce its laws even at great distance from it center of power. It was a midwife to the birth of true political parties that emerged in the following years. And it set the parameters of the great political debate of just what the meaning of the American Revolution and what it means to be an American really is, a debate that continues along remarkably similar lines to this day.This book will be of particular interest to those interested in the early Republic and the Washington Administration, the career of Alexander Hamilton, the Federalist - Anti-Federalist question, or the early American frontier. It is well written, well reasoned, and highly recommended. The decades following the revolutionary war are a fascinating period and many of the themes that led to the so-called whiskey rebellion - arguments over the role of the federal government, the federal government straining the letter and spirit of the constitution, the struggle and mistrust between rural and urban populations, political leaders out of touch with reality - are enduring themes that continue to this day.The stage was set in the 1780s and 1790s, when a federal government of shaky stability tried to expand its tax base by taxing distillers of whiskey. While the constitution did grant the power to do this ("internal taxes"), it had been widely believed that this power would only be used in times of dire need - to fund defensive wars, for example.The large, efficient eastern distillers paid the tax. The small western distillers, who often only made whiskey with their extra grain at the end of the growing season, resisted.Demagogues on both sides of debate whipped the people into a frenzy, resulting in ugly behavior from everyone involved. Eventually a rag-tag army was raised to put down the "rebellion" - but it had already run out of steam on its own and only two people out of the dozens arrested were convicted, and they were in turn pardoned.This book is a prime example of why Americans (at least stereotypically) find history boring. Because, frankly, it's a painfully boring book. Yet I couldn't put it down, because it was truly eye-opening to me to see how, a mere two decades after the founding of the United States, so many of the problems we face now were already being debated. It would have been a far more compelling read had the author drawn upon these parallels rather than insisting on "just the facts". 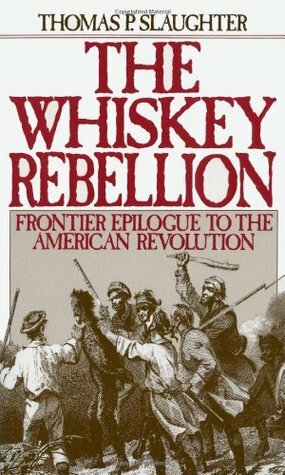 This book discusses the Whiskey Rebellion, a forgotten piece of American history. It's hard to encapusulate all the various sides and rationales and such. I think there's more that could have been written about here -- it focused more on two sides instead of giving a fair aspect to all bits of it. I found some of Slaughter's word choice problematic -- especially when referring to indigenous people and the poor indigent people in the western parts of the states. I think it was hard to read -- a lot of it got repetitive and boring. Not a big fan, but I am interested in learning more on the subject. An engaging read about a little-known movement opposing the new U.S. government in the largest citizen uprising before the Civil War. The Whiskey Rebellion prefigured quite a number of conflicting dynamics in American history: East vs. West, North vs. South, Jeffersonians vs. Hamiltonians, Democrat vs. Whig/Republican, moneyed interests vs. ordinary people, Anglos vs. Indians, taxers vs. tax-cutters, you name it. it was interesting to learn about this more obscure, but important, incident in the formational years of our country, but the author spent way too much time explaining the circumstances and then rushed through the small bit of action. it made for a dry read that was pretty repetitive. Following the American Revolution the fledgling United States needed revenue. A tax was placed on whiskey and many on the frontier started revolting against the taz. President George Washington was forced to call out the army. An excellent telling of a little know event in American history. A strategic and concise analysis of the political side of the Whiskey Rebellion, which I find to be an important part of early American history that is often overlooked. always like to read history of colonial america. the stories of what happened to our ancestors makes me appreciate what we have today. Enjoyed the book. Got a little confused with the timeline. Learned a lot about how our banking system struggled to get started.